David Lopez’s awesome variant cover for issue #7. X-Men: Blue is the X-book that is about the original five X-Men from the ‘60s who became time-displaced and now live in the present. That may sound like a complicated premise for an X-book — but you ain’t seen nothing yet. Okay, a little backstory: the original five (or O5) X-Men now operate out of Madripoor and are being trained by Magneto, whom most of the world thinks is dead. They’ve decided to stay in the present because...well, they can’t really go back the past, they’ve tried and it looks like the timeline already has a version of the original five X-Men, so they would be kind of redundant. So now they help out the mutants of today — and recently had a new member in the form of Wolverine’s son from the Ultimate universe join the team. Although Jimmy Hudson doesn’t go by “Wolverine,” it’s clear that he’s the Wolverine of the team (even though I would have preferred Laura, she’s having her own adventures). I didn’t really like how Jimmy Hudson joined the team, however — god, I hope Cullen Bunn doesn’t try and write a Scott-Jean-Wolverine love triangle again — because now the team was even more out of proportion. 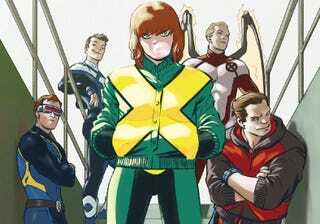 There were five guys to one girl — hell, six guys, if you counted Magneto, and still only one female X-Man. Thankfully, X-Men: Blue #8, written by Cullen Bunn, with art by Cory Smith and Joey Vazquez, changed that. It’s set during Secret Empire as Emma Frost (who is secretly in charge of the mutant state of New Tian) has captured most of the Blue team in order to stop them from destabilizing the peace between New Tian and Hydra. Jean and Jimmy, however, got away and soon are rescued by the X-Men’s Blackbird...who appears to be displaying some newfound sentience. During the fight against the Hellfire Club (who are holding the other X-Men hostage), the Blackbird starts projecting hard-light holograms and it quickly becomes apparent exactly who the Blackbird actually was. For those who don’t know, Danger is the physical manifestation of the Danger Room’s AI. She started out as a villain trying to get revenge on Professor Xavier after Xavier had “enslaved” her (he had known that she was sentient, but hadn’t been able to do anything about it, so just kept quiet), but quickly came around and became one of the X-Men’s allies. Yes, I told you it would get more complicated. Cullen Bunn definitely appears to be playing the long game, as he is using elements from his run on Magneto, like Briar Raleigh and Polaris. I really do hope that both Danger and Polaris stick around as members of the Blue team. They would definitely provide some different perspectives and help even out the gender ratio.